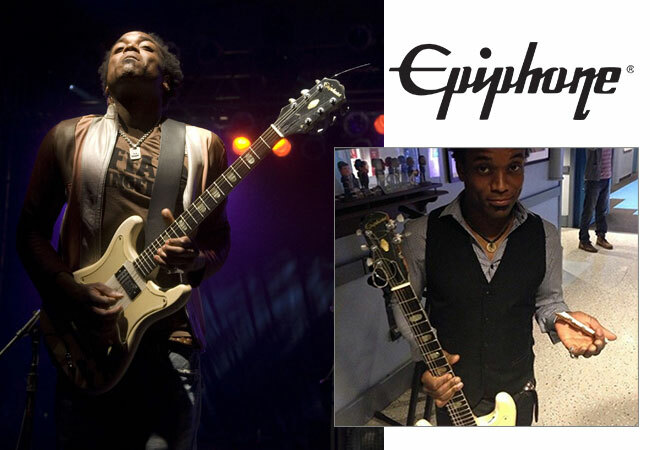 All of us at Epiphone HQ are fans of "Captain" Kirk Douglas, guitarist for The Roots, the house band for Late Night with Jimmy Fallon on NBC. How could we not be? Not only is Kirk a superlative player and a great guy, but his favorite axe is one of the rarest--and coolest--Kalamazoo-made Epi electrics, the Crestwood. 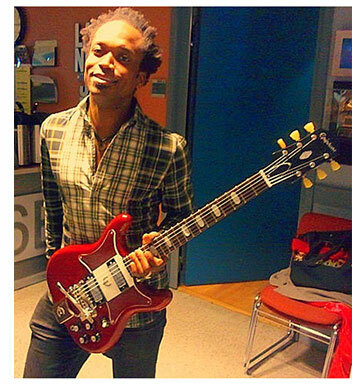 Kirk has been performing steadily with his '61 Crestwood for years with The Roots as well as many other music endeavors. 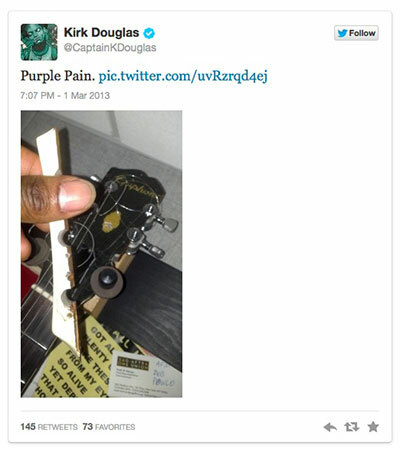 So when Kirk's longtime favorite musician Prince appeared on Late Night and borrowed his prized '61 Crestwood to perform "Bambi," Kirk was thrilled. And so were we when we saw the performance. Prince on an Epiphone? Fantastic! But then came the mother-of-all guitar tosses--a true iconic rock and roll TV moment--but not the kind you want to be part of. At the end of "Bambi" in a moment of performance bravado, Prince threw down the Crestwood and crack went the headstock, and crack went Kirk's heart (and ours too). Within minutes, word of the incident went out around the world: How dare he? What was Prince thinking? There have been rumors and misquotes for months about what really happened. So, during our recent visit to the Big Apple to check out Crossroads, we stopped by the Late Night studio at 30 Rock on Kirk's invitation to hear the true story, once and for all. So Kirk, set the record straight. What happened? Basically, Prince arrived to sound check sans guitar. I guess his guitar was on its way and in the meantime, he had to do a sound check. Our stage manager, Keith, offered Prince one of my guitars for him to play. I had several guitars there and this guitar, my Epiphone Crestwood, was one of them. I think to him it had a very inviting strap, given its purple hue, so he went for this guitar. I think, too, that Keith offered it to him because of how it looked. I've never seen one like this and people have been so cool after the incident to forward me information about these available from this year, which is '61 or '62. And so he used the Crestwood for soundcheck. Then his guitar arrived and Prince finished soundcheck with his guitar. Just before the show, Keith came to me and said: "Prince would like to use your guitar for the performance and would like to buy it from you." I replied he can certainly use it but he most definitely cannot buy it from me and then my guitar disappeared for a moment and then came back to me moments later after the rehearsal break. And then Prince came on. I was very excited to see him do the first song. He then came to me and said: "you'll let me see that other guitar?" And I'm enough of a Prince fan to respond: "yeah!" He asks to see my guitar in between his two performances. And then he went on to play the song and he's playing "Bambi," a Prince classic, and he's playing my guitar and I can't express how amazing it was to see that. This is your baby, after all. Yeah! It was amazing just to hear the tones that I'm so familiar with--hear these tones--reimagined sonically by his hand and it sounded amazing. At the end of the song, I thought he was going to play behind his head because he took the guitar off like this (demonstrates) but he kept going and then I just saw the thing sail in the air I just couldn't believe what I was seeing when it came flying to the ground. Prince has done this before. Yes, in the past, he's pretty famous for tossing guitars in the air and someone being there to catch it. Since this incident, I've heard from several people that he's taken other people's guitars and tossed them and not arranged for anyone to catch it. He'd take care of it in some way later. But he's built a career of sort of being eccentric and it's one of those ways he expresses his eccentricities. And I do think he was in the moment and sort of... I don't think good judgment was going on in his mind but there's a point when you're making music and somebody like him just ceases to be and you're just the sound that you're making. I guess it probably sounds like I'm making excuses for him. But who knows what goes on in the mind of the person who conceived the movie Purple Rain? Just look at his entire career! There were numerous head scratchers and this is another one of them. This time I was the recipient of the inconvenience. So what happened immediately after the incident? Right after this happened I went right into the control room and he was there and he apologized and he said he would take care of it. And still I was holding the broken guitar and I did ask him for him to sign it. I said, "well, you broke it, can you at least sign it?" To which responded: "No, I haven't signed anything since the 70s." So, when I look at that, it's like damn do I have a story! Just like Dave Chappelle had his Prince story or Kevin Smith had his Prince story, I now have my own run-in. But the most amazing part of it is, the only reason this guitar was in this building for him to get anywhere near was because I was using the Epiphone guitar for a tribute to Prince at Carnegie Hall the following week. 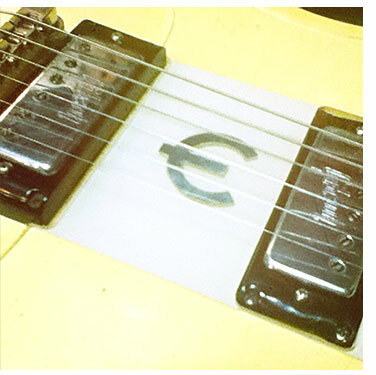 The whole reason the guitar was in the building was for the man who broke the guitar (laughs). So, you gotta have a sense of humor about stuff like that. I just imagine the Gods laughing at me. Do think Prince wanted to buy the guitar because he was already considering that he might throw it down after the performance? That could easily have been the case. He could have been thinking: I like this guitar. I wanna throw it at the end of the show and I'll buy it from him to make it all good. But I have my own attachments to this guitar for my own reasons. 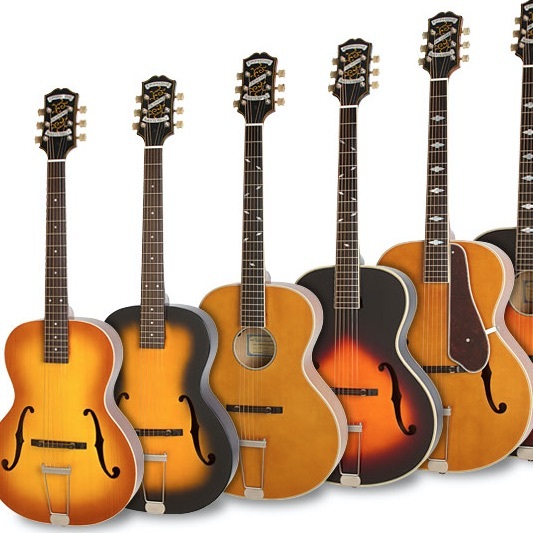 What is the story behind your Epiphone Crestwood? I found this guitar years ago, probably in 2004, at 30th Street Guitars in New York from a guy named Matt Brewster, who also put it back together. And I felt good with him doing that since I bought it from him in the first place. And ever since I bought it from him, he periodically jokes and asks to buy it back from me because he knows how special it is, too. I remember going to the store when I plugged it in, I was blown away by its singularity and tone. It had a beautiful snarly sound to it and if you look at the pickups here, these are the pickups normally found in Firebirds, they say Gibson on them. So much of this guitar is not original. I always say if I had the opportunity to live life again and go through everything again, I'd be happy to relive this experience because of the dialogue that it's created, because of the people who have reached out to me expressing their condolences about it. People reached out to say how much they felt for me as fellow musicians and how they would feel if something like that happened to them. A lot of people said it felt like it did happen to them because they know me. So that was good to hear from people. It was great to hear the dialogue created by this. When something like this happens, do you go and frame the instrument? Some people said "you gotta leave it like this!" I'm not sure there's been an incident like this in the era of instant Social Media. Everyone loves Prince and everyone loves The Roots so the word went out very fast. We all went through something there, seeing an ugly side of someone that you admire. 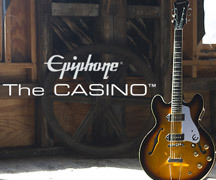 But for reasons like Epiphone reaching out to me and expressing their condolences--it was great. I didn't even know that these were being reissued. I wouldn't have found out as quickly. So yeah, it was an example of how social media is all-accessible to us and how positive it can be. As far as having a dialogue with such a large group of people without leaving my apartment, I could participate in my life with my wife and my kids and in the middle of that, I'm hearing from Vernon Reid from Living Colour and Pete Stroud from Sheryl Crow's band and I'm hearing from Prince fans--I'm hearing from so many people. And that was so cool. There was a feeling of unity that came about from this. And then when the guitar came back and it was repaired, I felt a renewed sense of attachment because I went through something else with it. In the end, It wasn't freaking that hard. Part of it was the emotion about the incident. This guitar has a special tone and I've made recordings with it that I hope will one day will come out. Actually with my band the Dust Rays, which is an opportunity for me to just plug into an amp and turn it up. It's my chance to be Marty McFly, standing in front of a huge amplifier. Whenever you find a guitar and it reacts with a particular amplifier, it's really special. There's a real union there. There are a lot of guitars out there but this Epiphone is special to me. I think of all the people who have played it, all the people who have played it before me, and whoever did these customizations. It's a total mystery to me and all I have with me now is all those vibes to put into a recording. That's something I want to live on. It was a complete honor for Prince to play this guitar but I can't give him the honor of being the last person to play this guitar. So that's why it was such a joy to have it back. And I actually got the Epiphone back just hours before the tribute concert. And Prince totally made good on it and took care of it. I don't regret Prince borrowing the guitar. Sometimes, what seems like something negative can turn positive and this was definitely a blessing in a very heavily shrouded disguise. Will The Roots be staying with Jimmy Fallon when he takes over the Tonight Show? What I keep hearing is The Roots are going along for the ride, too. And I'm really happy about that. I'm happy we're staying in New York, and I'm happy the show recognizes us as being part of the fabric and I feel really honored and blessed to be a part of it.